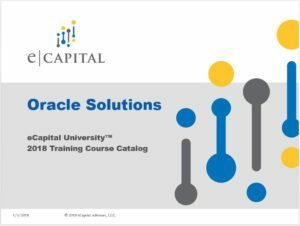 eCapital University courses are designed to empower our clients with the skills needed to be able to implement and manage their analytics solutions with confidence. Our focus is on ensuring client success and whether you are new to the technology, needing a refresher or looking to advance your skills, our training will enable you to maximize the organizational value delivered. As an IBM Platinum Business Partner and an Oracle Platinum Partner, hundreds of companies and organizations with locations around the globe have trusted eCapital to deliver advanced technical skills training to their teams. Why? eCapital’s training goes a step beyond traditional technical skills training through the added focus on the real-world application of the products. eCapital is focused on helping your team learning how to use the solutions in their critical day-to-day roles. Skilled: eCapital’s dedicated instructors are certified for the products they teach and have an average of over 12 years in the field. Hands On: Training with eCapital is immersive with over 80% of class time in hands-on labs. Flexible: Our training consultants will work with you to schedule training into your organizations schedule. Documentation: Training manuals are provided for each class, with ebook access also available. Affordable: Tiered pricing is available.